Composed by Bob Good. Classical Period, Repertoire, General Instructional, Wedding, Recital. Score, Set of Parts. 6 pages. Published by Surrey Dance Music (S0.418145). Cheeky little classical string quartet in the style of ... er ... Scarlatti, possibly? Anyway, it's only about a minute long and great for general repertoire, upmarket wedding receptions and so on. 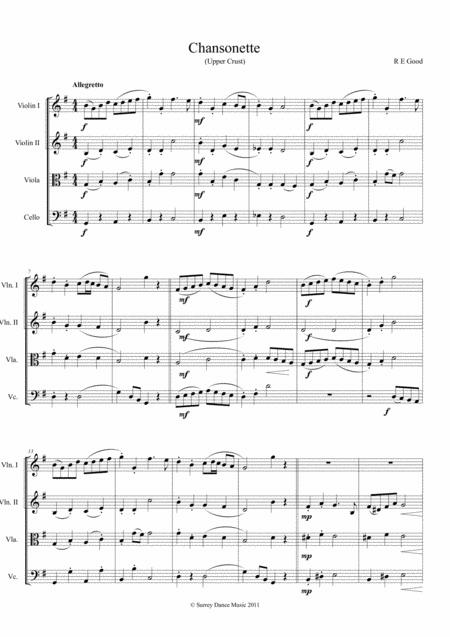 A very simple piece, so also great for a quartet starting out, or for instructional purposes. Easy for a quartet to play together. Need I go on?